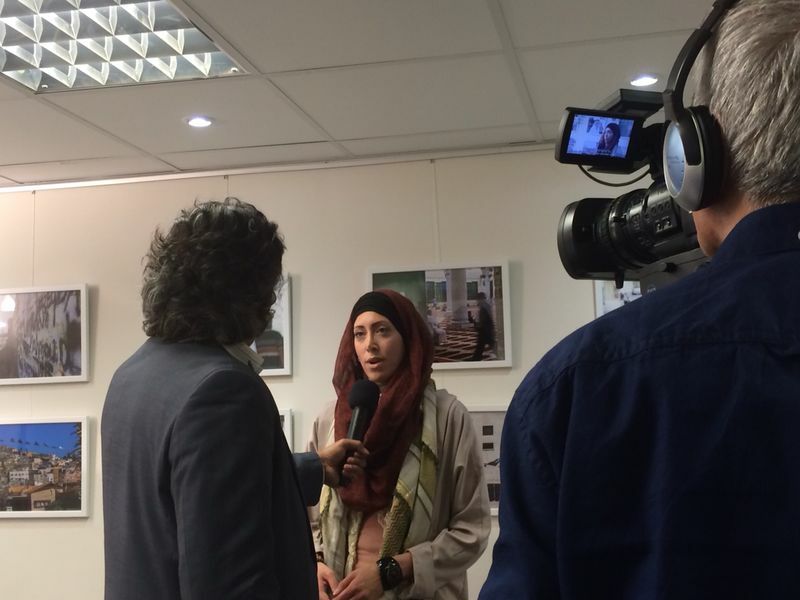 Thursday 19 June 2014 saw the launch of photographer Sara Russell’s exhibition ‘Another Day.’ The exhibition features the documentation of Sara’s recent trip to Palestine – she travelled there as part of a delegation last year. The evening was a great success that saw press, religious leaders and members of the community all attend. The exhibition was curated by Nasreen Jamal al-Lail who intended for the work to be displayed so a narrative played out. Starting in the bookshop, attendees were then led downstairs to the gallery where the photographs were fully laid out. Along with the photographs on the walls, two tables were laid out with brochures and pamphlets about the Palestinian cause. Visitors were welcome to buy tshirts or badges to display their solidarity with the Palestinian people. Sara spoke at length about how she wanted to portray the everyday reality of people who were living their lives under occupation. Sara’s trip to Palestine saw her experience fear and witness pain and suffering. She wanted to convey all of this in an abstract way; to raise awareness through symbolism that was still easily accessible. Once Sara had finished speaking questions were posed by the listening audience. Many were very moved on the night. The exhibition runs until 30 September 2014 and entry is free. Schools wishing to book class visits with a presentation and Q&A with the artist should contact the IHRC office on 020 8904 4222 or email nadia@ihrc.org.